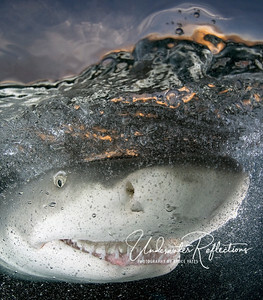 Award-winning "Cheshire Cat Grin" - A 7-foot lemon shark on the surface at sunset (you can see the orange sunset through the water). 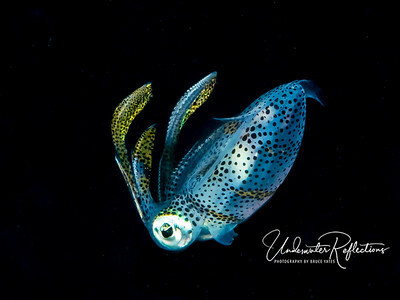 This photo - winner of the Oceans division of Nature's Best Photography's 2008 Windland Smith Rice Awards - was on display in the Smithsonian Museum of Natural History last year. Of all the photos I've ever taken, I think this one has evoked the most comments and interest...probably because of the shark's apparent "expression," which can best be described by reference to the cat in Alice's Wonderland. 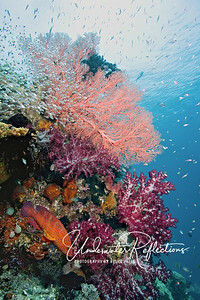 See last page of the "Underwater Highlights" gallery for a few photos from the Smithsonian exhibit! Aquaman - Master of the Seas? 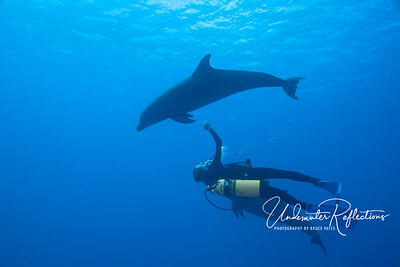 This photo is representative of the awesome encounters we had with whale sharks on this trip. 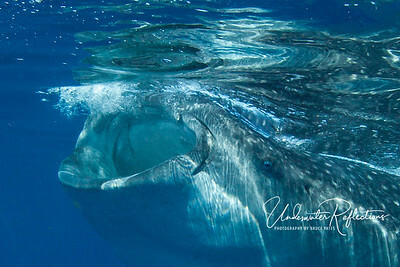 We snorkeled near/among dozens of 20-40ft whale sharks as they skimmed plankton (mostly bonito tuna eggs) off the surface. 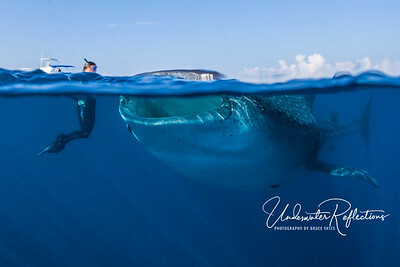 Jen, one of our small Wetpixel group, could literally reach out and touch this behemoth, but she just watches (in awe) respectfully as he passes. 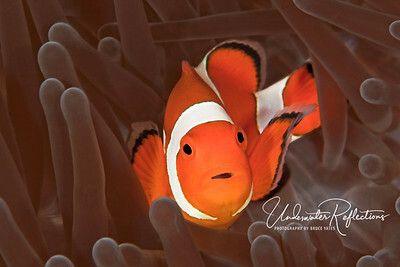 Nemo in brown velvet (Indonesia). This is a False Clown Anemonefish, but to most people it is Nemo, the movie star. 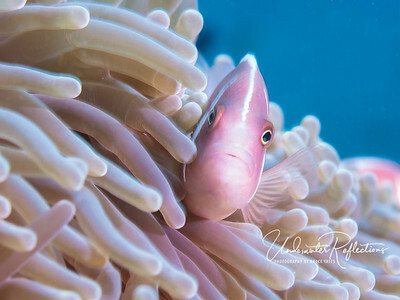 Living in a brown anemone, he is protected from predators because the anemone stings them, whereas he is immune to its sting. 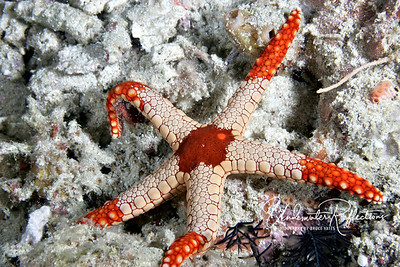 In return, he brings the anemone food. It is a truly symbiotic relationship. 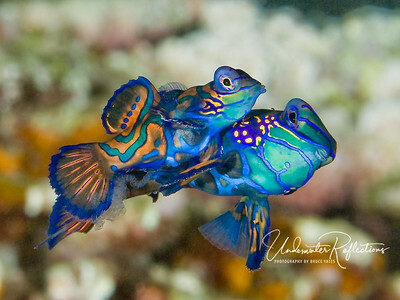 Mandarinfish (2 inches) pair in mating ritual - I was extremely fortunate to capture the moment of the female releasing her eggs. 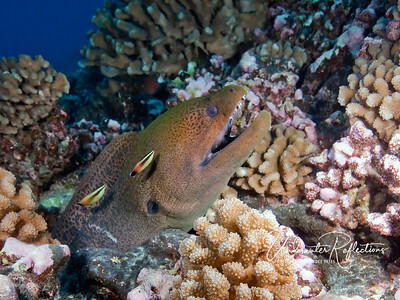 This ritual, which takes place only at dusk, lasts only about 5 seconds, as the two pair up, rise above coral rubble together, and release eggs and sperm into the water simultaneously - immediately dashing back down into the rubble thereafter. 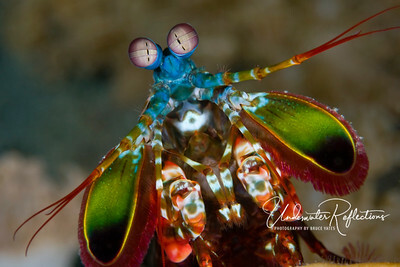 This photo won second place in the macro category of the 2009 Underwater Images competition. 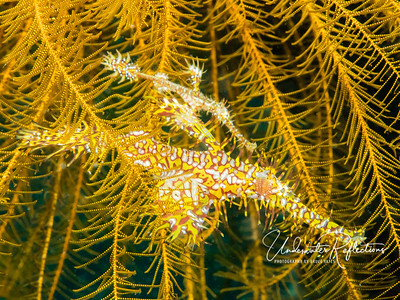 Yellow Ornate Ghost Pipefish pair (speaking of crinoids) living in a yellow crinoid/ As is true of many sea creatures, the large one is the female (4 inches long), and the small one is the male (2 inches). Coleman shrimp pair (1/2 - 1 inch) living on Fire Urchin. 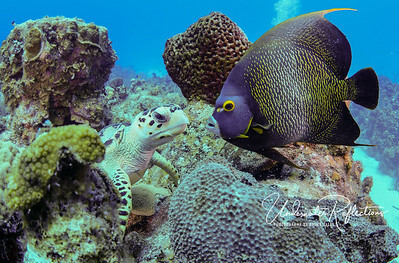 A Hawksbill turtle and French Angelfish get nose-to-nose in what looks like a face off! 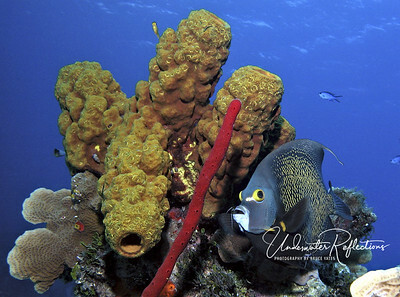 In reality, the turtle has been munching on the brown sponge (above center), and the angelfish is checking for any spongy bits on his beak/mouth. 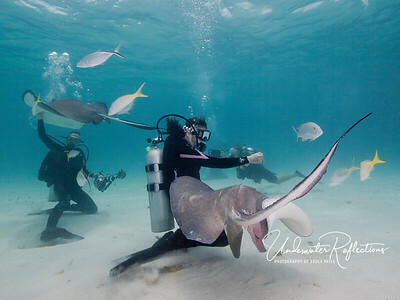 Stingray City (Grand Cayman) - Diving with wild Southern Stingrays that have become acclimated to humans is a truly unique experience. 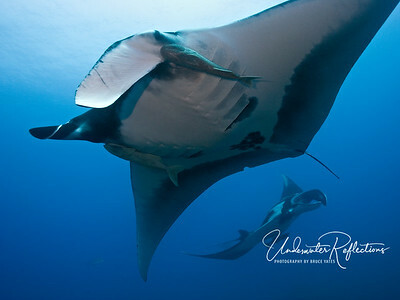 Attracted by bits of squid the divers hold, the rays have no qualms about being in close quarters or even letting divers pet them (their skin is velvety-smooth) as they pass. Contrary to popular belief, stingrays do not aggressively use the stingers in their tails, but only do so as a "last resort" defense when they believe their lives are being threatened. 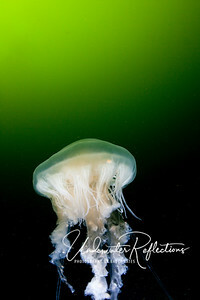 "Fried Egg" Jellyfish (Nootka Sound, British Columbia Canada). The green is not Photoshopped in for effect. The cold waters of B.C. really are green - due to algae. 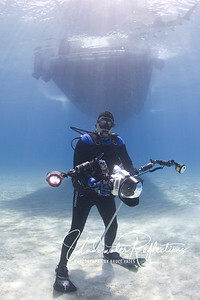 Although the greens are captured with more brilliance by the camera than they appear to the diver's eye, there's no mistaking (if the 50 degree water didn't offer a clue!) 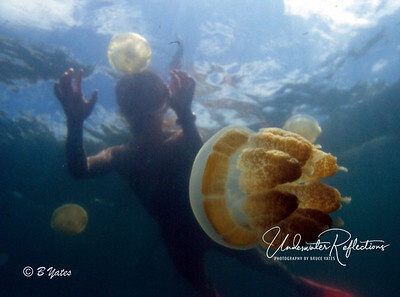 that you're not in tropical waters! Bow gun on the MV San Francisco Maru. 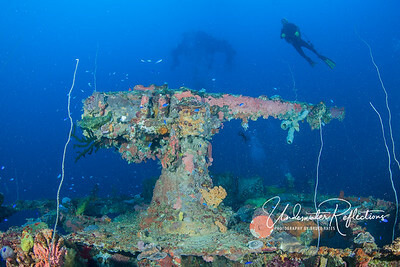 Because of the depth (this shot was taken at 165 feet), there is a bit less life growing on this gun than many of the shallower wrecks in Truk (due to less sunlight). 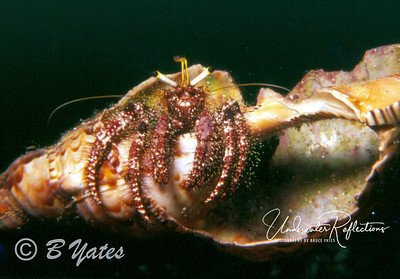 I was feeling a little "narc'ed" on this dive (technically Nitrogen Narcosis--a high concentration of nitrogen due to the pressure, similar to the feeling you get at the dentist with nitrous oxide), so I only shot a few photos on this wreck and then headed back up. This big gun was certainly one of the highlights! Who is posing for whom?! 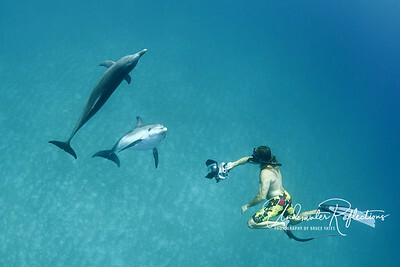 Bottlenose dolphin (Bahamas) interacts with snorkeler/photographer. 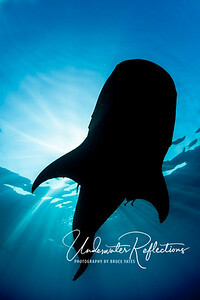 Whale sharks have eyes that are tiny compared to most fish. Then again, they recognize food by the feel/taste on their mouth, not sight, so they have no need of larger eyes. 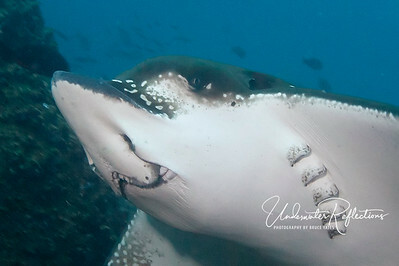 Spotted eagle ray head (Galapagos). 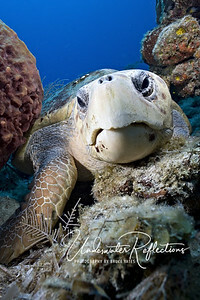 You can see that his nose and mouth are suited for hunting mollusks and other small critters in the sand. 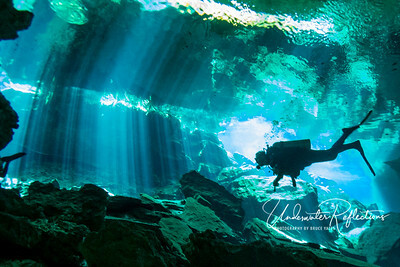 Sunlight refracts at odd angles in the waters of cenotes, due in part to the high density and organic material in the water. 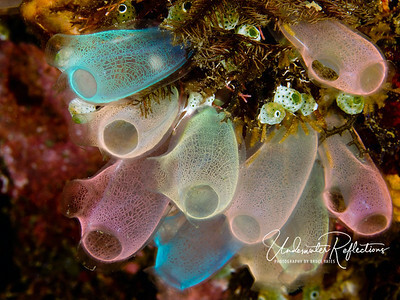 Pastel Bells - colorful tunicates (sometimes called "sea squirts"), only an inch long and very delicate. Each has two holes, and they draw water in one and out the other, filtering little bits of food as it passes through. 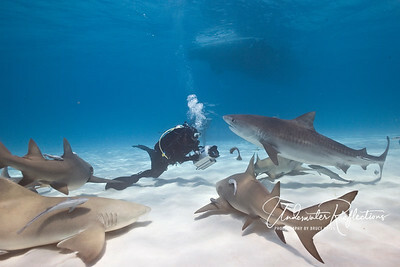 Closing In: A curious tiger shark and several lemon sharks seem to be closing in on Eric Cheng, who is intent on shooting video of them. 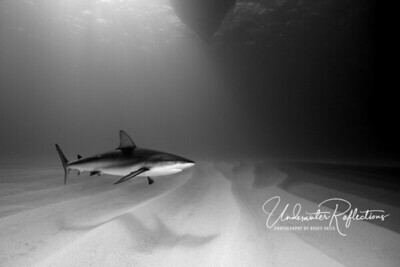 Although divers certainly must show respect to sharks, it is rare for sharks to actually attack humans. Thus, Eric is not being foolhardy. On the other hand, I think we can be sure there is at least a little adrenaline running through his system at this particular moment! Pretty in Pink! 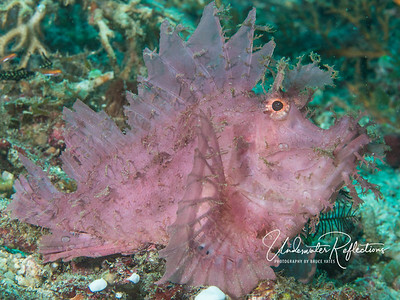 Rhinopias (aka 'leafy" or "lacy") Scorpionfish (8 inches long). 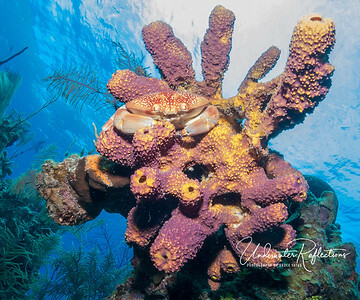 The name scorpionfish derives from the fact that all of his fins are venomous. Look but don't touch! 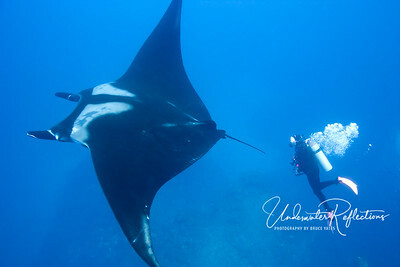 Giant manta ray with Judy (Socorro, Mexico). 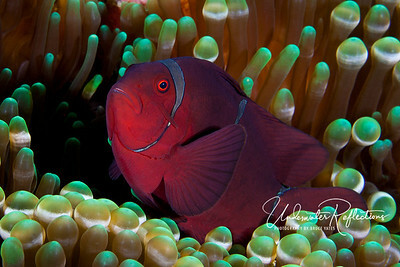 Spine-cheeked (also known as "maroon") anemonefish (Indonesia). Not as recognizable as "Nemo" but my favorite type of anemonefish. Peter Rabbit? 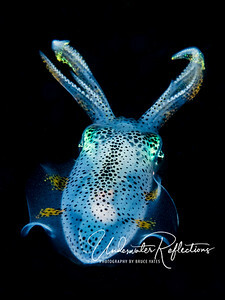 No, just a small (2-3 inch long) squid at night. 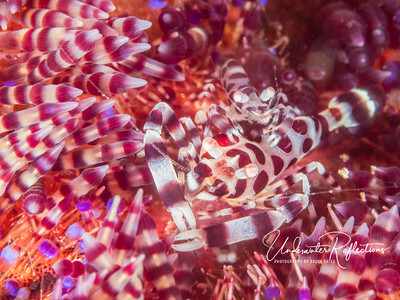 Nudibranch (Indonesia) - Also sometimes called "sea slugs," nudibranchs - whose name means (roughly) "naked lung" - have external gills that are generally located at the back (in this case, the feathery cluster on the left). 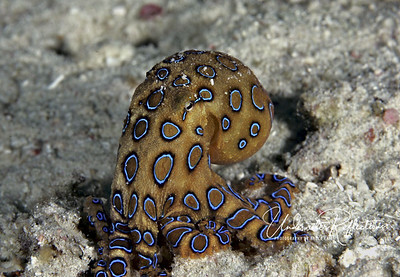 They come in a wide array of colors, but are often brightly colored as a warning to would-be predators that they are poisonous to eat (similar to the poison frogs of the rainforest). 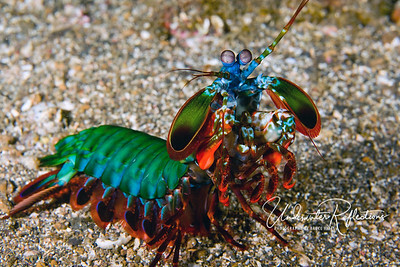 Colorful nudibranch (Indonesia). 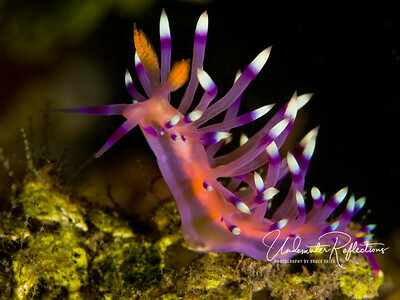 This nudibranch actually eats stinging/poisonous corals, and rather than digesting them, is able to transfer the stinging cells into the tips of its "spines" so that anything that tries to eat/nibble on it gets a sharp dose of stingers! 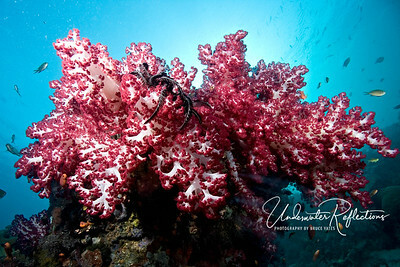 Nudibranch (Indonesia). 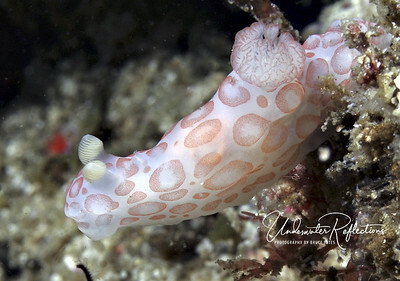 This unusual "nudi" is apparently very rare. 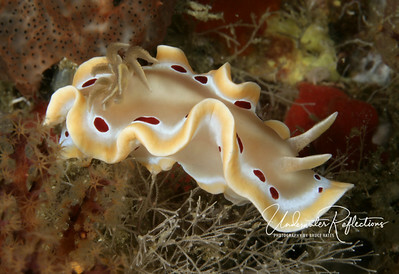 Not only have I never seen another one like it, but several nudi experts say they never have, either. 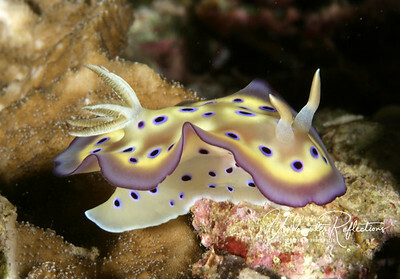 Note its external gills in a flowery formation at the top (the nudi's rear). 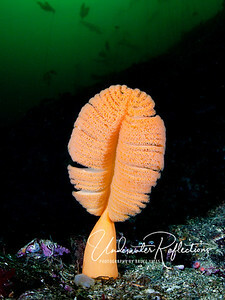 Sea Pen with kelp above in the distance (Nootka Sound, British Columbia Canada). The green is not Photoshopped in for effect. The cold waters of B.C. really are green - due to algae. 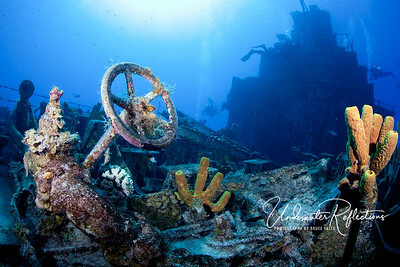 A Russian destroyer (Cayman Brac) that has been sunken for 15 years sports yellow sponges, as well as recognizable pieces of metal.